ONE OF AMERICA'S CLEANEST, GREENEST BEACH COMMUNITIES. 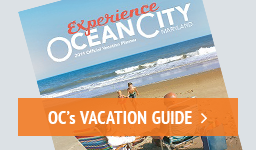 Ocean City, Maryland is famous for our sparkling white sand and our clear, blue bay and ocean waters. Now we're famous for our efforts to keep them that way. In 2007, we were awarded Five Stars for Water Quality by the Natural Resources Defense Council (NRDC). Only 17 other beaches in America received this honor, recognizing OC's water as some of the cleanest in the nation. We were also honored by the NRDC in 2004 as a "Beach Buddy," one of only four American beaches to win that distinction. Our road crews use recycled concrete for road base, and recycled glass in asphalt. And we keep our streets exceptionally clean, to prevent litter, sediment and other debris from reaching the bay or ocean. White sand, blue water and a green philosophy. All reasons why, if you're concerned about the ecology, you should visit OC ASAP. For more about environmentally responsible tourism in the Delmarva, click on the link below.